Decks made out of Brazilian Teak decking were constructed by people who value those special moments only outdoor living can provide. Every day, we hear from customers who adore their new Brazilian Teak deck or patio. Their reasons are always the same. This Brazilian wood decking option is fast becoming a must have in high-end homes due to its distinct array of benefits. 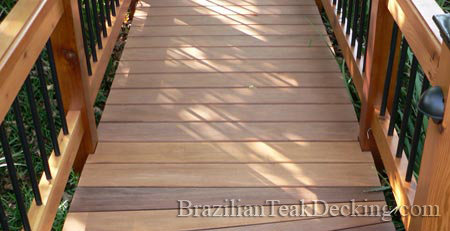 Discover why Brazilian Teak is so special and how it compares to other wood decking options. You can contact us to order a sample, get a free quote, or request that we call you to buy Brazilian Teak decking.